Play, Run & Don't Get Lost! Denis completed his education degree in 2005 and has been teaching Physical Education every since. Since becoming a teacher, he has coached a variety of sports including basketball, volleyball, track and field, golf and orienteering. He loves hanging out with his children either biking, hiking and golfing outdoors. Denis is enthusiastic about devloping physical literacy and enjoys adventure races where he can use his map reading and orienteering skills. He is thrilled about the the new Outdoor Adventure Airdrie program and is looking forward to coaching and leading the program. Bogi is always happy to be outside. She believes that for kids to grow up happy and healthy, they must spend significant time outside. She takes her kids along to do her favorite activities which includes mountain biking, hiking, paddle boarding, orienteering and xc skiing. Bogi is the AOA Executive Director and orienteering for many years. She has a B.Ed. Degree in Physical Education and over 15 years of coaching background from national level (gymnastics) to community coaching (cross-country skiing, orienteering). She also worked in the fitness industry as a trainer and program director, but her passion is with the outdoors for life. If you have any questions or feedback about the program, please let her know. 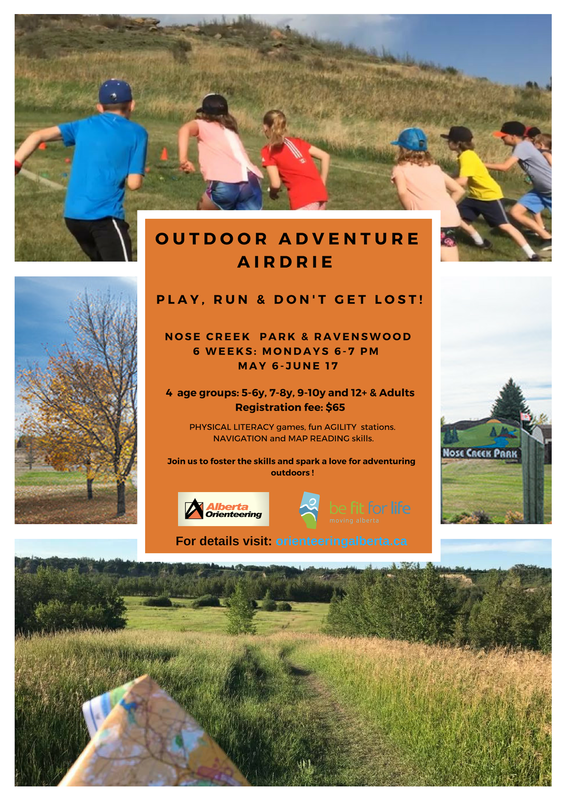 We are a community-based outdoor program in Airdrie, affiliated with the nonprofit Alberta Orienteering Association. Our program allows kids to develop competence, confidence and motivation to be active outside for life. We play games to have fun and improve agility, balance and coordination while developing skills in running off trail. We teach map reading and navigation . Put together, these activities allow kids to enjoy the sport of orienteering. We want to foster a family-focussed outdoor program to engage not only kids but youth leaders and parents as well. If you want to have fun, learn about maps and be active at the same time as your kids sign up for the Adult program. Details: To introduce different maps and have more fun we will switch locations (2 sessions in Nose Creek Park, 2 in Ravenswood and 2 in a diffent part of Nose Creek Park. Exact meeting spots will be confirmed later. The 5-6 years old group will have 45 min instructional time. Outdoor free-play is essential for kids' development. We find that after class the kids just want to play in the park, so we encourage the parents to let them play for 15 minutes after their sessions, to build confidence and have fun with other kids. Full refund until April 31st, 2019, in case you need to cancel. Our program is based on the goals and principles of the of the Canadian Physical Literacy & Long-Term Athlete Development model. Each session includes 3 stations: physical literacy, agility/endurance and navigation. Why should you try it? Builds competence and confidence to be outside, for life. Uses games and obstacle courses to build agility. Teaches navigation and map reading skills. Helps children to connect with our natural environment. Provides opportunities for decision making and independence. Gets everyone moving outside with a big smile, guaranteed! ​We would love to have you try our events soon! ​ the AGLC Casino fund to support our sport. Follow us on Social Media !